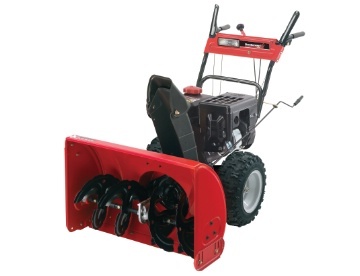 The Yard Machine Snow Thrower H97KJ is one of the larger snow throwers on the market. It has a 45 inch wide snow clearing width. It can also handle up to 22 inch high snow drifts, although the drift cutters can help you cut through drifts much higher. This is a powerful machine. Customers with long driveways or large areas to clear will appreciate the power. Also the snow clearing capabilities of this machine. Note you do not manhandle a heavy machine like this one. Instead you use its power to make your snow clearing easier. It does not have heated handles. 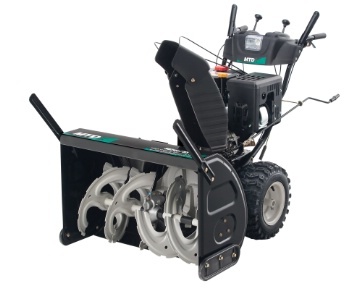 However you should be able to quickly deal with most snow conditions with this machine. It does have the standard 6 forward and 2 reverse gears to match your walking speed and the snow load you are dealing with. Since this is a large heavy machine, you will appreciate the steerable wheel drive. It let’s you change direction with the click of a trigger. 420 cc PowerMore™ OHV winterized engine: Quieter running, better fuel economy, cleaner burning. 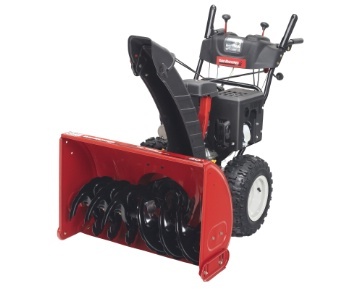 Engine: This Yard Machine Snow Thrower H97KJ comes with a 420 cc PowerMore™ OHV winterized engine: Quieter running, better fuel economy, cleaner burning. Remote chute tilt & crank – use both to aim snow in the desired direction. Arctic tested high-impact 6″ polymer chute: won’t rust, crack or dent! Oil pre-filled engine – gas it up and you’re ready to go! 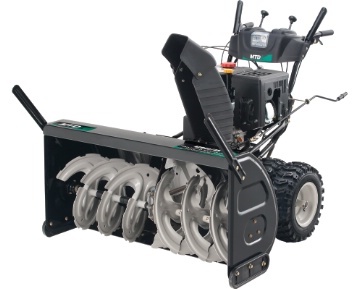 This snow thrower has lots of features that will interest many home owners in addition to the wide snow clearing width. It comes with a dash light for dark areas at night, and it comes pre-assembled. All you need to do is unfold the handles, check the engine oil level to make sure that the pre-filled engine is good to go and add fuel to the fuel tank. This machine also comes with a polymer chute which will not rust or crack even in the coldest temperatures. This Yard Machines snow blower is a powerful machine and should be treated with safety in mind. Carefully read all of the safety guidelines in the manual prior to operating the machine for the first time and follow these guidelines to ensure that both you and the machine do not have an accident. Prior to starting the Yard Machine Snow Thrower H97KJ the first time each day, perform a quick walk around check of the machine to ensure there are no loose parts and no leaking fluids. Check the engine oil to ensure that it is at the correct level as specified by the manual. Top up if necessary. Fill the fuel tank while the engine is cold and prior to using the machine. If you do spill fuel, wait until it has fully evaporated prior to starting the engine. Never spill fuel on a hot engine to avoid fires and always fill the fuel tank outdoors to avoid any possibility of vapors going into your house.